New Year's Eve has definitely changed for us over the years! No longer are the years of going out and staying out until the sun comes up! Now our celebrations revolve around pajamas, snacks, and movies and quite honestly I couldn't be more thrilled! Today I'm sharing a round up of some quick and easy NYE themed snacks for a fun night in! Who said a night in can't include a tuxedo? These adorable cheese and cracker tuxedos are perfect for ringing in the new year! You can substitute the cheese for a more kid friendly option if needed as well! Step up your traditional movie watching popcorn for the holiday by creating a special New Year's Eve blend! Let the older young ones celebrate with sparkling cider and rock candy for a festive bubbly beverage! The adults could easily substitute with your favorite champagne for a celebratory toast! The most iconic element of New Year's Eve is the kiss at midnight! 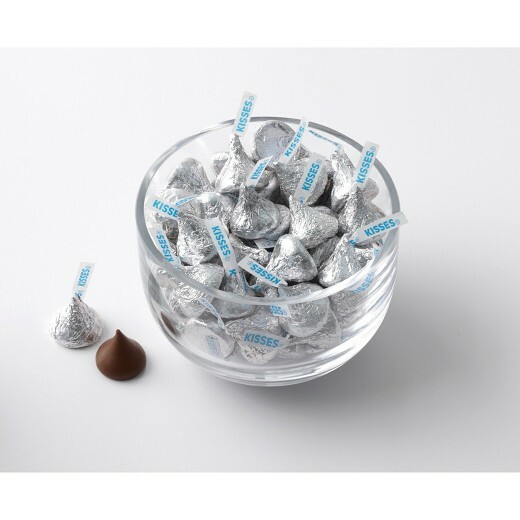 For a younger crowd, I love the idea of a bowl of Hershey's "Midnight Kisses!" It's a cheesy way to keep things fun and PG, especially if you're entertaining a preteen crowd! I know that we'll be trying out a few of these easy snacks this year! Do you have any traditions you like to serve for a night in? If so I'd love to hear about them! !